Quinnipiac’s Heather Schwartzburg pitches in game 2 of Sunday’s doubleheader vs. Sacred Heart. 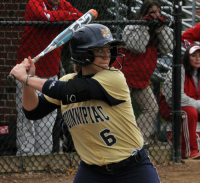 Quinnipiac’s Bridget Figmic swings in game 2 of Sunday’s doubleheader vs. Sacred Heart. Quinnipiac’s Ashley Heiberger swings in game 2 of Sunday’s doubleheader vs. Sacred Heart. Quinnipiac’s Mina Duffy hits a go-ahead three-run home run in game 2 of Sunday’s doubleheader vs. Sacred Heart. Quinnipiac head coach Germaine Fairchild talks with catcher Ashley Heiberger and pitcher Heather Schwartzburg in the seventh inning in game 2 of Sunday’s doubleheader vs. Sacred Heart. 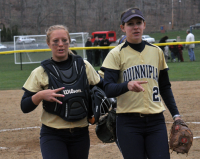 Quinnipiac’s Ashley Heiberger and Heather Schwartzburg celebrate after winning game 2 of Sunday’s doubleheader vs. Sacred Heart.